Fast flowering strains are always highly popular with marijuana growers, their ability to flower, bud and mature quicker than average strains makes them a great choice for both indoor and outdoor growers, especially for those living in states with a short growing season. In general, plants that are quick to mature are compact, bushy and Indica dominant, producing hard, swollen buds within 7-8 weeks. These strains produce high quality, potent buds with a generous coating of resin and usually a powerful ‘body-buzz’ and ‘stoned’ sensation, rather than the Sativa based cerebral high. 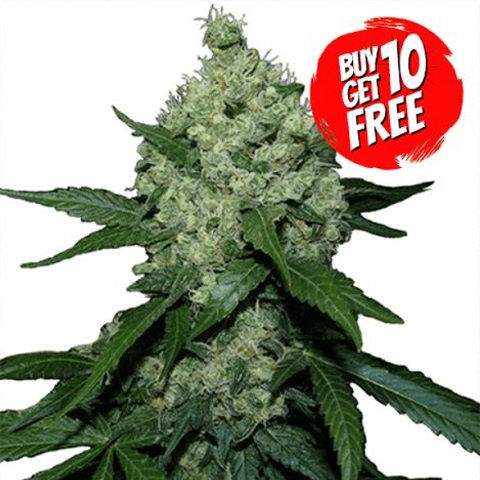 Autoflowering seeds are often considered fast-flowering, as the growth and bud development phases are combined, reducing the overall time the plant requires to completely mature. By planting a selection of auto’s, fast and longer flowering marijuana seeds, it’s possible to generate a staggered harvest from mid-Summer through until the Fall. We offer a selection of high quality, fast flowering marijuana seeds, all sold with guaranteed delivery and germination. Pure female genetics, devoid of any male chromosomes, ensure each of the seeds you purchase produce the finest female plant, capable of quickly generating hard, dense buds and highly potent cola’s. Fast Flowering Seeds For Sale.